Here’s a tasty twist on a versatile favorite that’s great year-round and a perfect fit for a 5 Element Spring diet. You can toss it with pasta or into a grain salad; use it as a pizza sauce or bruschetta base or as a garnish for soups, veggies and grilled meats. 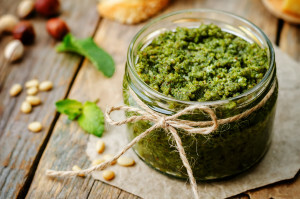 Pine nuts are traditionally used in pesto but walnuts are better in this recipe. The strong, meaty flavor of the walnuts balances the spunky, spicy flavor of the arugula yielding a good blend of flavors. Place all ingredients in the bowl of a food processor. Process until it forms a creamy paste, about 2 to 3 minutes, scraping the sides of the bowl once. Transfer to a bowl, cover and keep refrigerated until ready to use. Refrigerate for up to 3 days, or freeze for up to 1 month.